Crust Pizza is now selling low carb pizza bases in hopes of appealing to those after a healthier treat. Made from cauliflower and linseed, Crust says the bases are a first for a national Australian pizza retailer. 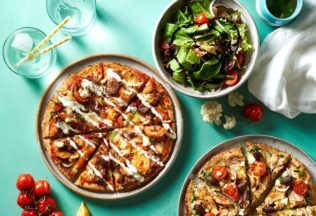 Crust General Manager, Renee North said Crust has a long history of catering to evolving consumer taste as the first Australian QSR brand to offer a vegan pizza in 2016. “Cheat night doesn’t have to be bad with our low carb range,” North said. “Customers who are looking for a lighter alternative can select from two options: our popular Chicken Florentine pizza, which can be made vegetarian, and our delicious Mediterranean Lamb pizza. “To put it in perspective, if I were to order a Chicken Florentine on a low-carb base, it would contain 30 per cent less carbs than if I ordered it on a regular base of the same size,” North said. In addition to introducing low carb bases, Crust Pizza is now selling a new pizza variety, ‘Creole Jambalaya’. Creole Jambalaya consists of Cajun spiced prawns, chicken, chorizo, capsicum, tomato crème base, lemon and parsley. Crust will also soon sell a Mezze Plate with lamb koftas, falafels, stuffed baby bell peppers, dips and zataar bread. Crust Pizza is part of the Retail Food Group (RFG).